We all know to get Admission for Graduate or Undergraduate Course in any University or College in India we need to qualify in Entrance Exams conducted by the Universities or the Common Entrance Exams conducted by the State or Central Government. Like in India, We also need to take some standardized Entrance Tests to Study Abroad. There are various Study Destinations all over the Globe offering Abroad Education. But each country requires different Tests. So by taking the appropriate Abroad Entrance Tests you can study in one of your favorite Destination. The Admission Requirements for Universities in abroad are also different. Each University has its own admission Standards. Some accept Standard Entrance Test Scores and Some Universities accepts English Test Scores. Through these Admission tests, The Universities ensure that you have the right skills and knowledge to successfully complete the course or not. So while applying to the University we should specially mention our Entrance Test Scores. Then the University will analyze the Scores and provides admission to the selected course. The Test Requirements may also vary from country to country. Some Countries like the USA require both Standardized Entrance Tests as well as English Language Tests. Where some countries like New Zealand, Australia provides Admission based on the Student Test Score in the English Language Tests. And some countries requires like Europe accepts Low Test Scores also. So before applying to any university it is better to check Entrance Test Requirements on its official site or you can also consult Overseas Educational Consultants in your city for Test Preparation. Which Entrance Tests to be taken to Study Abroad? There are Separate Tests to be taken by us for different Courses. We need to take some separate Standardized Entrance Tests for Graduate and Undergraduate Courses. And along with these Standard Entrance Tests, you also need to take the English Language Proficiency Tests depends on the Country you are applying. Sometimes you will also have an opportunity to get admission in the preferred university by displaying your strengths in other areas, such as your school grades, your application essay, or your experiences though you have less entrance test score. Here we have given the Popular Standard Entrance Tests and English Language Tests separately for various courses to Study Abroad. 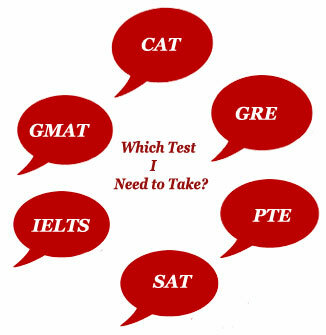 So check the Test Requirements and take the appropriate Test based on your course and the country of your interest.